Trees aren’t just single organisms; over time they become the center of a whole complex ecosystem. Birds, insects and small animals will all make their homes in your tree. Some of them are a benefit, some are a nuisance. But other plants will also settle there, and among those that appear most often are mosses. Mosses are a very large family of plants, containing more than 12,000 species, and while the largest species can reach almost two feet high most of them are small – less than an inch is typical. They’re simple plants with no flowers or fruit. Fertilization is usually carried out by rain splashing cells from male plants (or stems) to female ones, and a capsule full of fertile spores then extends from the plant on a long stalk. When the capsule splits the spores are released for the wind to carry them, and they’ll grow pretty much wherever they land. That includes on your trees. Many species of moss can grow quite happily on a tree. They don’t have real roots, only filaments (called rhyzoids) to hold them in place, and they don’t absorb water or nutrients through those. They depend on external water, so you’ll only find them in damp environments, but as long as a location is wet enough they can grow – they can even grow on bare rock. Unlike fungi they aren’t parasitic, so they won’t steal nutrients from your tree, and many people like the aged, natural look moss gives to trunks and branches. However although the moss itself isn’t directly harmful it can indicate problems. It often colonizes trees that aren’t in the best of health, so a sudden growth could be a sign of disease or lack of nutrients. A heavy growth of moss can also cause problems, although not directly. Moss collects and absorbs water, and the damp environment this creates makes an ideal breeding ground for fungi, parasites or rot. Some pests can shelter in it, hiding among the dense stems, which makes them and the damage they cause very hard to detect. Then there’s the issue of weight. Moss isn’t heavy, and even a huge amount of it wouldn’t endanger a tree, but its habit of absorbing water can be an issue. Some species can soak up over 20 times their own weight of water; a big tree with a dense growth on its trunk and branches could quickly soak up several hundred pounds of water in a rainstorm. Just to make matters worse moss often doesn’t grow evenly. Many species (but not all) are shade-loving, and tend to grow more thickly on the north side of a tree where they’ll be better protected from sunlight. That means any water they absorb won’t be well distributed, and the extra weight can bring down branches or even uproot the tree. Finally, moss can spread very effectively. It might not be a problem on your tree, but leave it alone and it could quickly spread to your lawn or even the walls of your home. Few things will overwhelm your neatly mown grass quicker than moss, and its sponge-like capacity for water isn’t something you want growing on your house either. 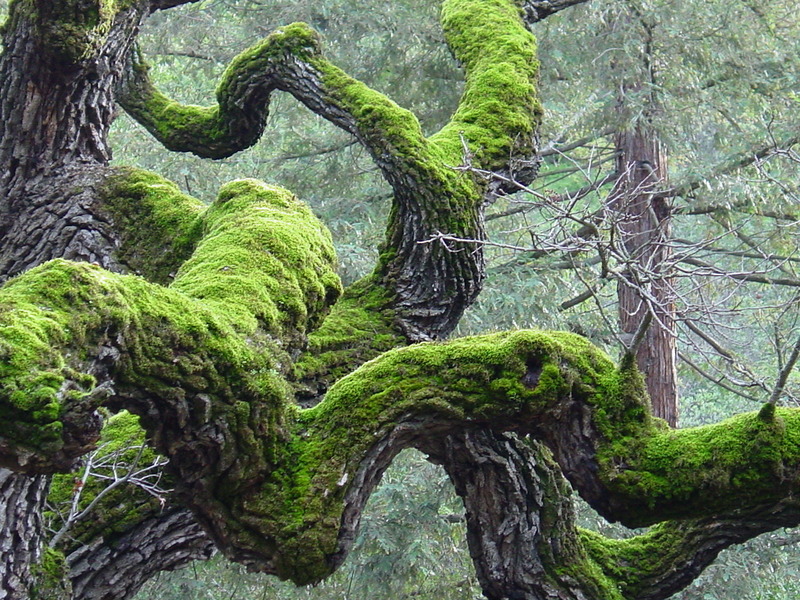 It’s up to you whether you leave moss on trees, but there are often good reasons for getting rid of it. The question is, how? Actually removing moss isn’t usually that hard, because it isn’t firmly rooted in the tree and the rhyzoids aren’t very strong. The simplest way is to just remove it by hand. Wear gloves (you don’t know what’s hiding in or under it) and carefully pull it off. It should come off in clumps, or maybe even as a single sheet if you’re careful. 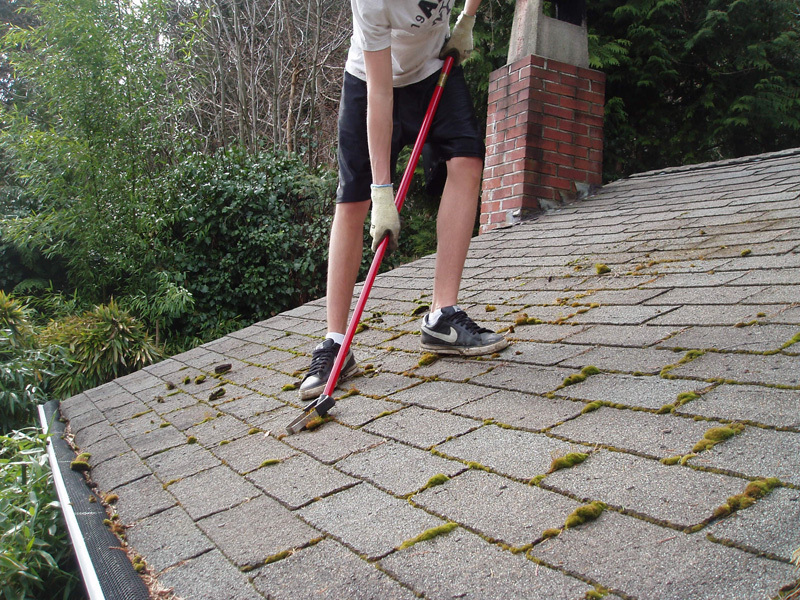 However clearing moss can damage buds, so wait until the tree is dormant in winter. That also makes it much easier to get at the moss without foliage in the way. Clearing large areas by hand can take a while, so another option is to use a power washer. One of those can strip moss away very effectively, but be careful – it can also damage fragile parts of the tree, or even rapidly defoliate parts of it. If you go with this option it’s usually best to do it in fall, after the leaves have dropped – and do it early in the day so the water has a chance to drain from the tree before frost sets in. Once your tree is free of moss there are some steps you can take to keep it that way. First, check its overall health. Vigorous trees are less likely to play host to mosses, so evaluate whether yours could do with better watering or some appropriate fertilizer. Look for signs of disease or pests – and while you’re at it search carefully for any signs of rot or fungal infection that may have set in under the damp mossy blanket. Some mosses thrive in sunlight but many common tree-dwelling species prefer shade, so consider how much light gets to the areas that were affected. Pruning can open up the tree, allowing more light and air in; this will discourage many mosses and often improves overall health and appearance, too. Removing any dead branches is essential – they’re ideal habitats for moss, and also very vulnerable to rot and fungi. Finally, if you’ve removed a lot of moss from your tree, don’t rush off to the compost heap with it just yet. Moss has many uses. Traditionally it’s been dried and used as insulation material, or for medicinal poultices. We have better alternatives now but moss still has some uses. Leave it in a sheltered spot to dry and it can be used as decoration – it adds interest to flower arrangements. It also makes a great liner for hanging baskets – its ability to hold water is very useful here, and it’s dense enough to keep soil in the basket. Shredded moss mixed with clay soil will lighten it and improve drainage, and some species are good at lowering the pH of alkaline soils too. There’s not always any need to get rid of moss; it can give an attractive appearance, especially in a naturalistic garden, and usually it’s harmless to your trees. It can cause issues though, so now you know what to look for and how to get rid of it if necessary.